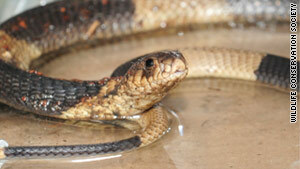 This Egyptian cobra captured the public's imagination during the five days it was out of its enclosure. New York (CNN) -- The Egyptian cobra that turned into media darling after its escape and subsequent capture at the Bronx Zoo is looking for a name. The Bronx Zoo and the New York Daily News are asking the public to vote for the best name of the mischievous cobra. After receiving 33,000 suggestions, they whittled the list down to five nominations, zoo spokesman Stephen Fairchild told CNN. -- Agnes, which is Greek for pure or holy, and is also a reference to St. Agnes. -- Amaunet, an ancient Egyptian goddess, meaning 'the female hidden one." -- Cleopatra, the last ruler of ancient Egypt, who supposedly killed herself by means of an Egyptian cobra bite. -- Subira, which is Egyptian for patient. -- Mia, an abbreviation for Missing In Action. The public can vote for their favorite names on the zoo's website. The 3-ounce, 20-inch reptile slithered out of her enclosure on March 26 and turned up five days later, after zoo officials scattered rodent-scented wood shavings to lure her out in hopes of a meal. Zoo officials still don't know how the snake got out, director Jim Breheny said. "Anyone who has ever dealt with snakes or kept snakes knows that they are notorious as escape artists," he said. The disappearance of an animal whose venom can kill an elephant in three hours and a human in 15 minutes sparked more amusement than panic, drawing 200,000 followers to an anonymously authored Twitter feed. It had the snake taking tours of the city and threatening to drop down the chimneys of unsuspecting city dwellers. All the attention has brought plenty of notice to the zoo, Breheny said with a laugh. "It certainly has put us out there," he said. "But we would have preferred to be out there for another reason." Zoo workers will closely monitor the snake to make sure she's suffered no ill effects from her escapade, then will put her back on display so people who have been so supportive since her disappearance have a chance to see her, Breheny said. The winning name will be announced on Thursday.